As long as it's not a plain white shirt, the real kit should be better than these. One offseason event that gets soccer fans excited is a kit launch. Some teams make lots of offseason signings, some teams don’t but every team releases a new shirt design and everyone has an opinion in each kit. MLS teams operate on a two year schedule where each team alternates between releasing a primary and secondary kit. 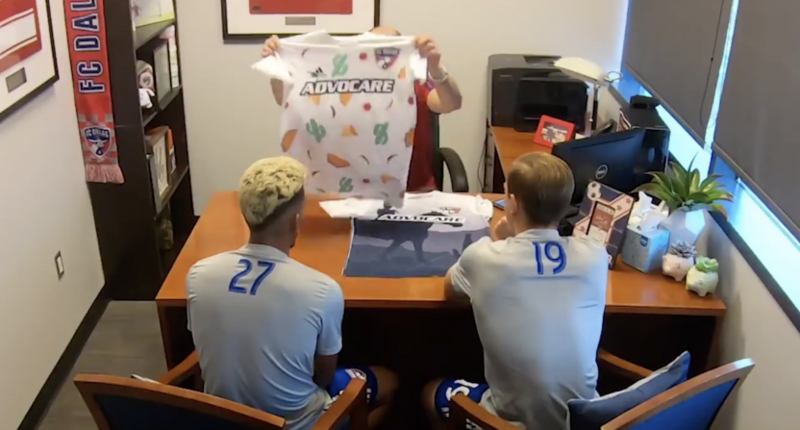 To promote the launch of their secondary kit, FC Dallas decided to place hidden cameras and prank players by showing them three intentionally ugly designs to see how they would react. The results are what you would expect when someone reacts to such a hideous design. One or two players figured out they were being pranked and were looking for the cameras. Every player was less than thrilled about any of the designs. While the players saw the real thing, FC Dallas didn’t unveil the actual kit on-screen in this video. This was simply a teaser for the reveal tomorrow. Given that Adidas’ kit designs have been plain and quite frankly lazy on the whole, if FC Dallas is planning on going for a primarily white shirt like most every other team has done this offseason, there’s still time to call an audible and go with the cowboy design. That one was decent looking.